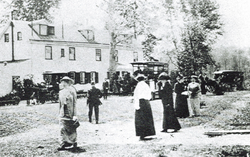 Participants gather for the 1914 meeting in Ambler, PA. In May 1913, in the small farming community of Ambler, Pennsylvania, 300 women, led by Louisa King of Alma, Michigan, discussed plans to “promote horticultural and agricultural interests throughout the country between women bound by this common interest.” Organized in January 1914, the Women’s National Agricultural and Horticultural Association elected Mrs. King its first president. 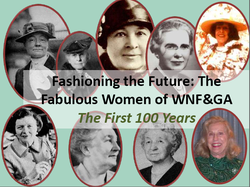 Renamed Woman’s National Farm & Garden Association, to emphasize the individual responsibility of each member, the association was formally incorporated in October 1919. The Ann Arbor Branch came into existence in the fall of 1946, when Mildred Matthaei and her newly formed Horticultural Committee agreed to join fortunes with the national group and its Michigan Division. The Ann Arbor Branch was formally accepted into WNF&GA membership on September 25, 1947. The Branch held its first Greens Market in December 1947 (last in 2009) and its first Garden Walk in 1991. The Ann Arbor Garden Walk(tm) is our major annual fundraiser. Through the Walk and smaller garden visits and events during the year, we raise about $25,000 annually for scholarships and community projects. In addition to philanthropic work, the Ann Arbor Branch has a dedicated Horticultural Therapy committee, who work year-round with seriously ill children at U-M’s Mott Children’s Hospital. We are proud to be one of the longest-serving volunteer groups at Mott. Learn more about our “Flower Ladies” here. Our small, all-volunteer non-profit organization of about 130 members manages, year after year, to raise a significant amount of money for local garden-related projects and student scholarships and internships. Since 1947, Ann Arbor Farm & Garden has distributed more than $600,000 in charitable gifts. In May 2017, Ann Arbor Farm & Garden voted to become an independent nonprofit group, withdrawing from the national and state Farm & Garden organizations. We will continue to treasure our rich Farm & Garden history as we grow into a new future. Some things will never change, however. Along with our philanthropic work, Ann Arbor Farm & Garden is valued for the lifelong friendships that form while working side-by-side with accomplished, creative, talented people toward a common goal. We are a sociable group, and organize a variety of events throughout the year that enable members to meet and talk informally. Every member contributes, in ways both large and small, and it is that commitment and dedication that allow us to successfully uphold our mission of growing green communities. More than 60 years of memories, activities, and community support are captured in the Ann Arbor Farm & Garden archive at the U-M Bentley Historical Library. These materials are available to members and anyone wishing to research our organization's rich history. To help you get started, this archive finding aid describes the collection and what each box contains. First presented in March, 2010, this presentation gives you an idea of the innovations of AAFG women, past and present.